July 2016 – Narooma Rotary Club Inc.
We had good news this week that Linda Ord had her operation and is recovering well. On Thursday we had a lively meeting with Bob Aston giving us a 3-minute talk on some of his experiences in Narooma Rotary Club in decades past. 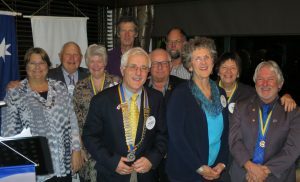 It seems they were fun times and I hope someone in decades hence will look back on their time this decade in Narooma Rotary with similar memories. I gave an outline about the 1000km I walk will be doing next year and why I will be trying to raise funds for ‘End Polio’ and Friends of Rang’I between now and when the trek begins in 8 months time. Members who tried to lift the 22kg pack that I will be carrying brought home to all that the trek is not simply a walk in the park. Donna was the saleslady for the jewellery and other items from Kenya, which seemed to be a hit and from the response at the meeting. We will definitely have a stall at our markets in the warmer months. It is a win win situation as we source all the items from Rang’I, we pay the going rate for them, not wholesale but from people trying to eek out a living making and selling the items and all the profit from the mark-up when we sell them here goes back to Friends of Rang’I. A very successful markets were held on Sunday, though it was extremely cold at 6.00am, thankfully the sun came out and made it an enjoyable market. Members managed to organise the stall holders, sell more than 170 whale tickets feed the crowd our usual fare. I was amused with the response of many of the stall holders as to “Why are you so happy” when it was obvious everyone was cold. I just felt that if you put on a happy face it can be like the flu, infectious. I also realise I was happy because I wasn’t swimming with the NUMNUTS and the Blue Balls at Bermagui where the water temperature was a bracing 130. Finally, we wish Rolf a very happy and joyous visit to his homeland and parents in Switzerland. 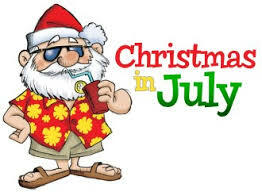 Next week I hope to report on our Christmas in July fundraiser on the 31st at Donna’s and my home. 12 Members were present was well as 2 guests, Donna Anderson and Iris Domeier. Mike Young led the welcome and President Michael led us in a toast to the Rotary Clubs of Nice in recognition of the work these Clubs are doing to assist those in need after the terrorist attack of 14 July. Chris O’Brien asked us to toast the memory of Jack Whitman, Jack would have turned 89 on 21 July. 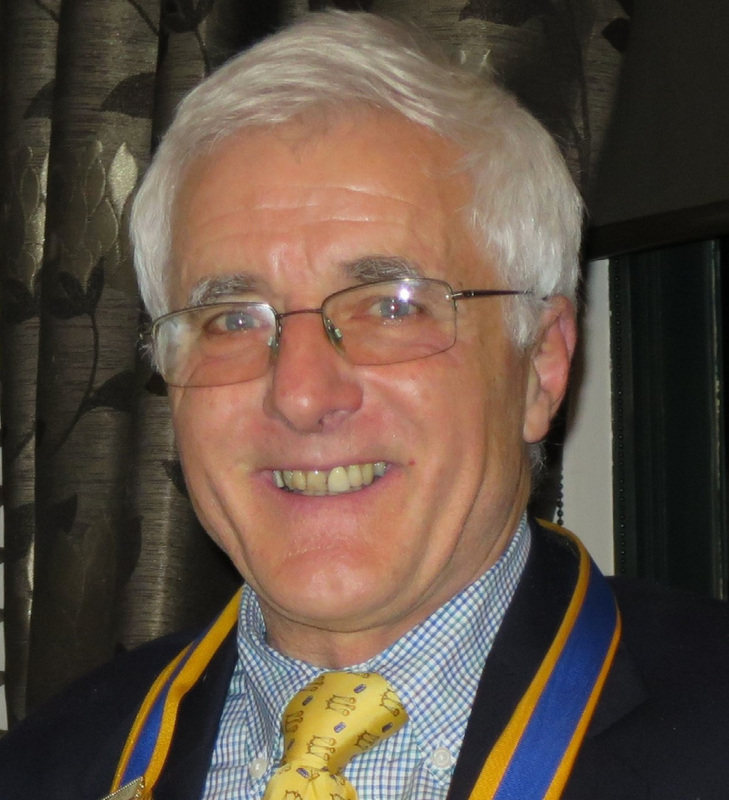 As President Michael has mentioned, Bob Aston gave a 3-minute talk on Rotary in Narooma back in the early 2000’s. He spoke about the movement of the markets from the Plaza to NATA Oval and the role Paul Cropper and Bill Phillips had in making it happen. He also spoke about the current food van and how any why it was purchased and fitted out in the 2002/3 Rotary year. The van replaced a much older one that didn’t meet health standards and has suffered some external damage when being towed by one Jack Wightman. To assist the Friends of Rang’I raise funds for the Sr. Jennifer Hawthorne Samber Quality School in Kenya. Michael told us that his desire to help raise funds to end polio was partly based on the fact that he had been diagnosed with a mild form of polio some many years ago. He also gave us a history of the Friends of Rang’I and its successes in supporting the school. Michael and Donna became involved through a young person by the name of Michael Hawthorne who I understand went to school with Michael and Donna’s children in Tamworth. Michael Hawthorne played a key role in forming the Friends of Rang’I group. Michael expects that it will take him 6 to 8 weeks to walk the track. And of course to find out more about Rotary’s effort to end polio check RI website. Happy moments included Rolf telling us about his upcoming trip back to Switzerland and Bob Antill updated us on the new house – It was successfully transported from Wagga Wagga to Lake Conjola and in place on the block. Sandra provided us with an update on MUNA, students have their resolutions and are working hard to be well prepared for the event when it takes place on 14 to 16 August. Iris won the port and John Doyle the wine. 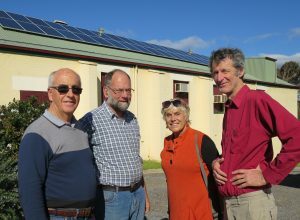 Publicity is well underway for the upcoming Renewable Energy Expo with an article in the Narooma News. Thanks to Laurelle for a copy of the article – see below. Mike Young, John, Angie and Frank discuss planning for the expo. School of Arts Hall with solar cells purchased by Rotary in the background. A Renewable Energy Expo in Narooma on 26-27 November will be a must for householders and business owners on NSW’s south coast concerned about their future electricity costs. The Expo is a Narooma Rotary Club Community Service project. ‘Many people are trying to work out how to best minimise their power costs, and there’s a lot of information, products and suppliers out there who can help,’ said Expo coordinator Frank Eden. ‘We’re working to ensure the best and latest information on renewable energy will be available at the Expo and its associated forum, so people can prepare for the future, save money and also help protect the planet. The Climate Council says that coupling solar panels with battery storage could be the cheapest way to get electricity within three years. ‘That will certainly feature at the Expo, but we also want to include other forms of renewable energy where we can,’ Mr Eden said. The Expo will be held in Narooma’s Sport & Leisure Centre with a Forum and Expo dinner in Club Narooma on the Saturday night. The Expo webpage expo.naroomarotary.org.au has more information. Potential exhibitors or sponsors should ring Frank Eden (0434 197 110) or Mike Young (0409 894648) for more details. Chris has organised an interesting speaker for 11 August. Annette Kennewell from the South Coast Health and Sustainability Alliance (SHASA), a not-for-profit group based in Eurobodalla who help to make renewable energy more accessible and more affordable. SHASA is coordinating a solar bulk buy for the Eurobodalla community. Please encourage friends and guests to come along to the meeting. ‘Well, son, I guess one day you will need to find out anyway! Your Mum and I first got together in a chat room on Yahoo. I write this just after having a balmy swim with the NUMNUTZS at Bar Beach. It was a pleasant but cool 15.5Co though, I suspect that is definitely outside the square for most members who would possibly consider it barmy and not balmy. It seems school holidays (grandparent duties) and cool nights kept our numbers down this week but a lively assembly and Board meeting was had. The status quo regarding the ducks remains and the development of our revised constitution and rule changes are in the able hands of Frank, Sandra and Rod. No doubt any constructive contributions would be appreciated by the group. Bob and Merinda successfully craned their new home onto their site last week, we wish them all the best in getting it organised and ready to enjoy. All in the club wish Linda Ord all the best with her forthcoming operations and we look forward to seeing her back on deck soon. While missing Linda’s contribution on the Board for the next few months we welcome Sandra Doyle to replace her and to guide our Club through the many Youth projects that our Club promotes in the local community. At this week’s meeting I will attempt to explain what is happening with regard to our Club’ s 1000km walk in Western Australia next year. I will also outline why someone who dislikes walking will not only attempt to complete the walk but walk up to 5000kms in preparation for the event. Why? To support END POLIO NOW and Friends of Rang’I efforts to alleviate some of the effects of poverty in rural Kenya. If you have not already done so please let me know as soon as possible if you are coming to our CHRISTMAS IN JULY. Partners/friends are welcome particularly if they have deep and generous pockets. Every dollar given on the day will go into the fundraising account with nothing deducted for expenses etc. It should be a great Sunday afternoon. The Editor was absent last Thursday entertaining visiting friends, so he unable to update you on the meeting in detail, however, President Michael’s ‘Outside the Square’ provides the most relevant pieces of news. Want to know more about the history of the Rotary Foundation? How is our Scholar, Connor Ross going at uni? PP Charmaine recently received this email update from Connor -some great results! 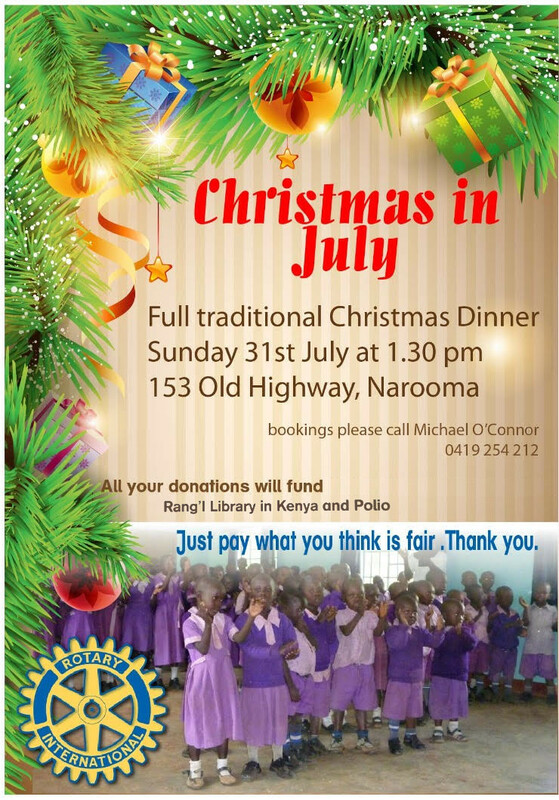 I hope you and all at Narooma Rotary have had a good start to the year. I’ve had a very busy one, releasing and promoting an EP of my music through February and March, and sound designing for an original student theatre Triptych production at Melbourne Uni in the latter half of the semester. I must’ve done an alright job at this latter, as I’ve already started work on sound designing for Melbourne University Union House Theatre second semester production of Macbeth, which looks to be a very unique and challenging take. All in all, the year is looking very exciting as I work on diversifying my skillset. Today I received my results for the past semester, which had a focus through my core subjects on the history of popular music genres and how they played into broader socio-political contexts. I found this both very interesting and challenging, which was great. My grade point average (GPA) is 3.6 out of a possible 4. My continuing thanks once again for all your support through my studies. On a wet and cool Thursday Rotarians were cooking and helping out with NAIDOC festivities at the Narooma Sports and Leis ure Centre. Bob, Merinda, John and I got cooking at two locations on the Old Highway (Antill’s and O’Connor’s) with Sandra, Lyn and Ang helping to receive and serve the goodies. Given by the quantities of food consumed the effort was appreciated by those present at the festivities. That night we had our first meeting of 2016/17 and had a great talk by Alicia Smith on her dedication to her sport of water polo and the effort it takes to be an Olympian. Peter Harley then told us about his niece going to compete in Rio in the sport of BMX. We wish her all the best in her endeavours. 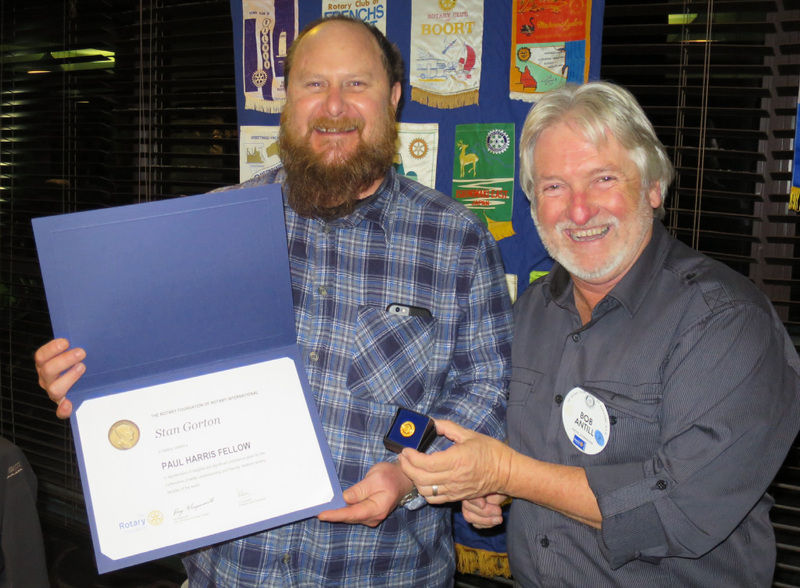 Stan Gorton of the Narooma News was honoured as a Paul Harris Fellow in recognition of his incredible contribution to the great community we call home. Bob Antill did the honours and the acclamation from all was testimony to how we all feel about the great work that Stan does in our community. Last Thursday’s meeting was the last for our exchange student, Radar, who returned home on 9th July. Radar clearly expressed his appreciation of his hosts, Bob and Merinda, Peter and Karen and Lynn and all in the Club who gave him an unforgettable experience. We do hope he will come back someday to say hello. He is a fine young man and we all wished him well for his journey home and for his future. This year is our Foundation’s 100th year and I hope that by putting a $2 coin on a regular basis into the money boxes handed out at the meeting we will be Centurians by June 2017. IF PLAN ‘A’ DOES NOT WORK REMEMBER THERE ARE 25 MORE LETTERS IN THE ALPHABET. Guests included our speaker, Alicia Smith, Merinda Antill, Iris Domeier, Stan Gorton from the Narooma News, Nikki from National Parks and for the last time, our exchange student, Radar Lin. As Michael indicated in ‘Outside the Square’ the meeting was ‘full on’. First off Past President Bob, presented a Paul Harris recognition to The Narooma News Editor, Stan Gorton, for service to the community. Stan was honoured and greatly humbled by the award. He indicated that our Club’s recognition meant a great deal to him, especially during a time when the local paper was undergoing significant change. Our guest speaker was Alicia Smith. Alicia was a former goal keeper for the Australian Water Polo team. She represented at numerous elite events including 2 Olympic games, Commonwealth Games and World Championships. Alicia proudly passed around her two Olympic Bronze Medals (Beijing and London) as well as her World Championship, Silver Medal. Alicia spoke about how she got into water polo; the physical, emotional and financial costs of competing; the difficulty in juggling work, study and training in a lesser known sport; the intense competition for a spot in the team as well as the drama of waiting to hear if she made it onto the Olympic team. Alicia is a delightful young person and a great ambassador for Australian sport. Merinda reminded us that the meeting was Radar’s last as he was due to fly home on the weekend. Merinda spoke about how much she and Bob enjoyed having Radar in their home as well as the changes they had observed in him during his time in Narooma, Bob told us that Radar had received an outstanding report from Narooma High School, coming first in many of his subjects. 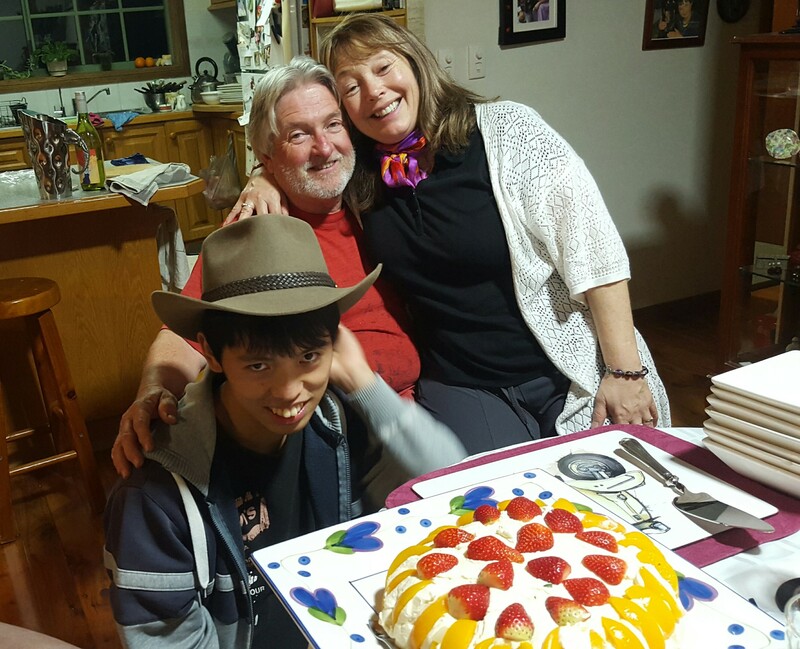 Radar thanked the Club for hosting him as well as host parents Bob and Merinda, Peter and Karen and Lynn for looking after him. Radar assured us that he will keep in contact with us and encouraged us to visit Taiwan to get a real sense of Asian culture. Happy moments included Bob Antill telling us that the lawn mowing business had been sold and that the house would be finally delivered next week; Chris O’Brien also told us that she had sold South Coast Lighting; Frank revelled in the fact that he no longer was the Beacon Editor; Lynda Ord told us of the wonderful life and times of a mother in law who had passed away at the ripe old age of 101 and Peter Hartley proudly informed us that his niece had made the BMX Olympic team. Using a law firm to draft a new constitution or to do it ourselves. If you have other items for discussion at the assembly, please let Michael know well before the meeting. Michael has also asked us to ‘Think Outside the Square’ for ideas for Narooma Rotary for 2016/17. Have a read of the Rotary Leader, click http://www.rotaryleader-en.org/rotaryleader-en/en201607?pg=1#pg1 to find out more. She agreed that it was time that he should know what was in the box. When he opened it, he found two crocheted dolls and a stack of money totalling $95,000. The new Board with President Michael. 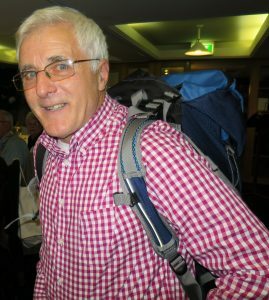 30th June 2016 will I hope, be a night to remember, as the fun and laughter we had at changeover, led by our MC Peter Bull highlighted how Rotarians can have fun even when important events in the Club are taking place. It was a pity that our well-deserved ROTARIAN OF THE YEAR, LYNDA ORD, was not there to receive the accolades for the tremendous work she puts into our Youth projects. I also thought it was fitting that she followed on from last years recipient, David McInnes who worked tirelessly to get our Model United Nation Assembly participants so well prepared that the motivation has swung over to this year participants. 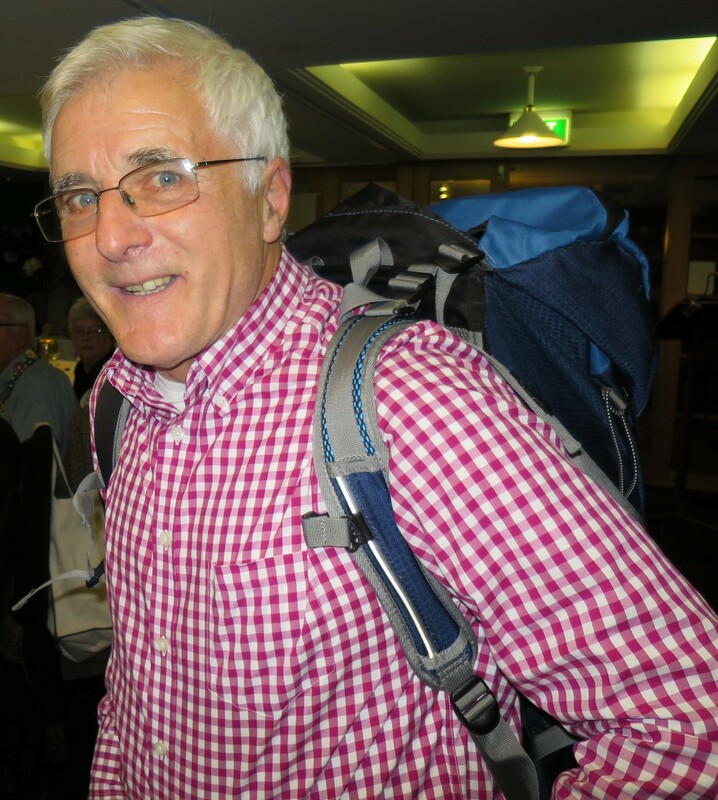 Another “missing in action” was Stan Gorton of ‘The Narooma News’ who was a well-deserved and popular recipient of our Paul Harris Fellow, but never fear he should be with us this week. Our theme for this year is SERVING HUMANITY and I hope we can do that by being innovative and by liaising with other Clubs in their projects as many hands make light work. We are all motivated by the same ideal of doing good in our community as reaching out beyond our town with International Projects. My first official task of our 2016/2017 year came the next morning when I attended Narooma View Club’s 38th birthday. Your President was the only male in a sea of women and surprisingly the only representative from a service club present for the celebration. Focusing on the theme “Serving Humanity” I decided to serve up scones, jam and cream to the all the workers inside and outside the polling booth who were doing a great job upholding our DEMOCRACY and in essence “Serving Humanity”. The Australian Election Staff Supervisor was somewhat stunned to be asked permission if this Rotarian wearing his shirt could hand out the scones but the workers seemed to enjoy it. Those outside from all political hues laughed and joked and it set the tone for the day with individuals from all political persuasions helping each other out. The stunned response, then laughter, from the dozen or more voters exercising their democratic duty who also received a scone while waiting in line was a sight to behold. It was a sudden spur of the moment thing and alas I did not get a photo but as there were over 40 scones handed out, Rotary’s name got a positive boost in our community. That was my THINKING AND WORKING OUTSIDE THE SQUARE MOMENT. Being spontaneous does have its rewards. Yes, last week was the Club’s annual changeover. More than 60 Rotarians, partners, visitors and guests attended the evening, a great reflection of Rotary in our community. 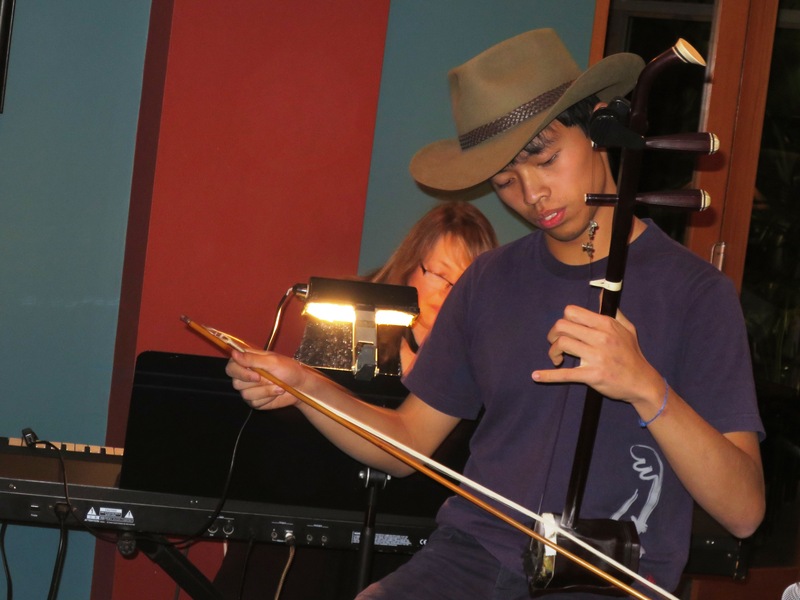 Below is the article contributed by Laurelle Pacey to the Narooma News, it provides an excellent overview of the evening. 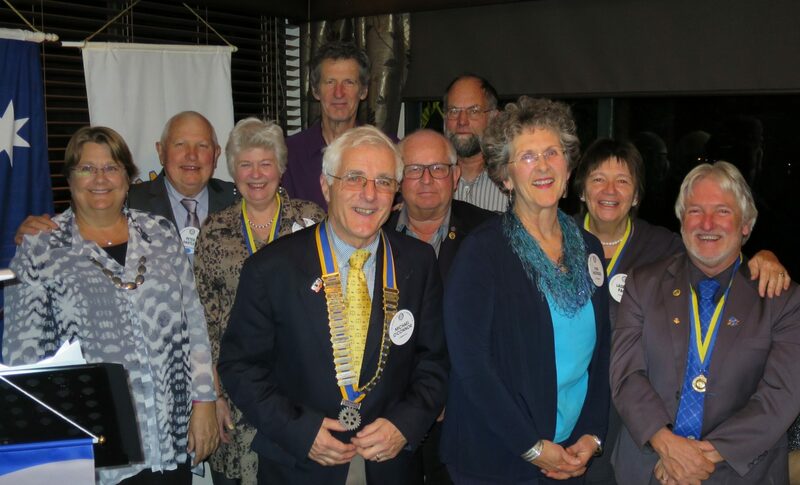 Narooma Rotary celebrated a great year last Thursday night at the Whale under the presidency of Bob Antill. ‘I am blown away by how many people came here tonight,’ President Bob Antill said. The 65 guests included the Rotary District Governor’s representative Past District Governor Bruce Gruber and his wife Jill, Eurobodalla Shire Council Mayor Lindsay Brown and his wife Lynn, incoming Rotary International Director Noel Trevaskis, and representatives from Bega, Batemans Bay and Moruya Rotary Clubs, Narooma Lions and Quota Clubs, and many local volunteer organisations. Mr Antill paid tribute to all Narooma’s service clubs and volunteer organisations ‘who keep our little part of the world humming’. 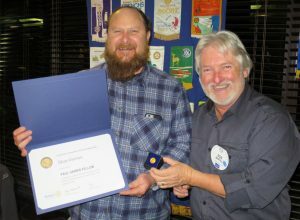 He said it had been a great privilege to lead Narooma Rotary ‘and its 20 wonderful members’ over the past year. A highlight had been hosting Rotary Youth Exchange student Radar Lin from Taiwan. Radar returns home next week. ‘When I look back over the last year I am amazed at what we have achieved,’ he said. 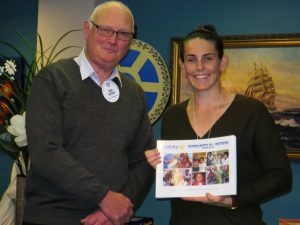 In that time Narooma Rotary has given over $37,000 into the community, both locally and internationally, from proceeds from Narooma Markets and various fundraisers including raffles, film nights at the Kinema, and the annual Duck Race. ‘We punch above our weight and we do it with pride,’ he said. Several donations were made on the night, including to the five local Rural Fire Brigades, Monty’s Place, Narooma Surf Life Saving Club, Snowy Hydro Southcare, and the Asha Foundation in Nepal. In outlining the Club’s plans for 2016-2017, new Narooma Rotary president Michael O’Connor said he wanted ‘to reach out’ to other local service clubs and possibly work together on some projects. Other highlights on Thursday included the excellent musical recital by Merinda Antill and Radar Lin and the raffle win by Rolf. Chris has organised a great speaker to start off the new Rotary year. Alicia was the goalkeeper in the Australian Women’s Water Polo Team from 2003 to 2012. She was an Olympic Bronze Medallist in 2008 and 2012 and a Commonwealth Games Gold Medallist in 2008. A wonderful achievement! Alicia even has a Wikipedia entry. According to this wonderful free encyclopaedia Alicia was born in Helensburgh and attended Helensburgh Primary and Kirrawee High Schools. She also met Prince William at a barbecue when he was in Sydney in 2010. I reckon she will have some interesting tales to tell us about the event. She is currently the Coach of Sydney University’s Lions Premiership team. Alicia lives in Dalmeny with her husband and two young children. President Michael has asked me to be the Beacon Editor for 2016/17, a task I am happy to do, however, the Beacon will be a more valuable resource and a better read if members contribute. I would love to have your stories, views and jokes to include for the benefit of all members. Please either post contribution on the website or email them to me. The deadline is 6:00pm Sunday evening. One night, a Delta twin-engine puddle jumper was flying somewhere above New Jersey. There were five people on board: the pilot, the world’s greatest athlete, the world’s smartest man, the Dali Lama, and a hippie. Suddenly, an illegal oxygen generator exploded loudly in the luggage compartment, and the passenger cabin began to fill with smoke. The cockpit door opened, and the pilot burst into the compartment. “Gentlemen,” he began, “I have good news and bad news. The bad news is that we’re about to crash in New Jersey. The good news is that there are four parachutes, and I have one of them!” With that, the pilot threw open the door and jumped from the plane. The athlete was on his feet in a flash. “Gentlemen,” he said, “I am the world’s greatest athlete. The world needs great athletes. 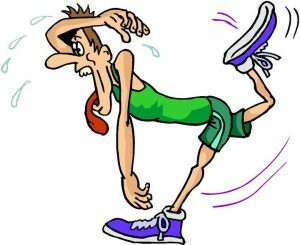 I think the world’s greatest athlete should have a parachute!” With these words, he grabbed one of the remaining parachutes, and hurtled through the door and into the night. The smartest man rose and said, “Gentlemen, I am the world’s smartest man. The world needs smart men. I think the world’s smartest man should have a parachute, too.” He grabbed one, and out he jumped.